I choose China to study Kungfu for different reasons that I will here explain. Last year, when I started to practice Wing Chun in Europe, I hoped to learn a defense technique but also what lies behind martial arts: the different philosophies (Taoism, Buddhism, and Confucianism) and meditation, which I knew anything about. Unfortunately, that didn't happen, since training was only based on techniques without any call to what being a martial artist really means. So, after finishing my University in October 2014, I had the chance to take a few months off and travel. I thought that continuing my studies of Wing Chun in China was a good idea, so I started to look for some school and I was happy to find out that it was still possible to learn not only the technique, but also the deepest reasons that make martial arts so special. Also, even though I didn't know anything about Qi Gong or meditation in general, I was hoping that it could help me focusing on myself, to learn something more about what my role in the world is and how to be a man with good values. 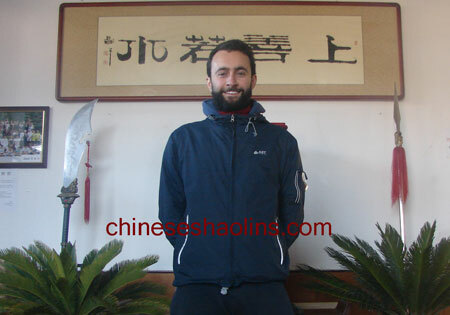 These reasons led me to choose China kunyu mountain to learn Kungfu. 2. I will list my gaining from this experience. （1）The importance of looking for perfection and of consistency. Even though perfection probably doesn't exist, still each one of us has a potential. By practicing martial arts here, I have learned how important it is to practice over and over each form, until it becomes a mechanical movement that we don't have to think about, it just comes naturally as well as applications using. This principle applies not only for martial arts of course, but to every aspect of our lives. In order to achieve good results in our job, in our hobbies, in our relationships, consistency is necessary.（2）Qi Gong. I am still a beginner in this, but all the people with more experience in this field have beautiful words for it. I am now feeling my Dentians for the first times and it is a fascinating experience. I will keep on practicing it for the years to come for sure, in order to establish a deeper relationship between my mind and my body.（3）The power of Now. I decided to come here at the academy without my computer and without any data plan for my phone, in order to get rid of the external environment and to focus on myself, my readings, my writings and emotions with the people here. This helped me to understand how important it is to live every moment in depth, without wasting time in doing great plans for the future, and without procrastinating.（4）Consciousness. It is fundamental to establish a deep relation between our body and our mind, without letting the external environment influence us. A strong consciousness about who we are and the values that drive us is important to maintain a good balance in our life, and to explore our hidden potential. I now feel more balanced thanks to this experience, even if I still have much to learn about myself, especially through Qi Gong. On top of being a very nice person, quiet, calm and respectful, he suggested me a book that taught me many things about how to change my behaviors in a better way. To be honest, many of the things that I could read in this book were actually already in my mind. Anyway, I think it was a sign of the fate that someone would suggest exactly that book exactly at this point of my life. Also, he told me about his experiences in Qi Gong, opening up a world completely new for me. His experience is a source of motivation for me to practice Qi Gong every day. It is the same for Alexis, very good and quiet person. On top of this, he came here with the sequel of the book that Alexis suggested me. Tough, especially for people who are not used to these rhythm. Anyway, it is important to have a tough training schedule, since it is fundamental in order to practice martial arts and also because it is an important mental exercise, pushing our minds and bodies above our limit. I used to spend my free time reading and writing, on top of spending time with the good people I met here. (4) Translators：All good people, helpful and smiling all the time. The school is located in a beautiful scenario, especially during winter times when the snow comes down.Being surrounded by so much nature gave me stillness and calmness during my stay at the academy.